A couple of weeks ago me and my boyfriend were having a wander round the Clinique counter in Debenhams when a little display of 3-step Introductory kits caught his attention (I'm not sure why!). This is usually £20 but at the time Debenhams had a VAT free offer meaning this was only £16. My boyfriend thought this was a bargain so after a little chat with the lady on the counter regarding my skin type he bought one for me. 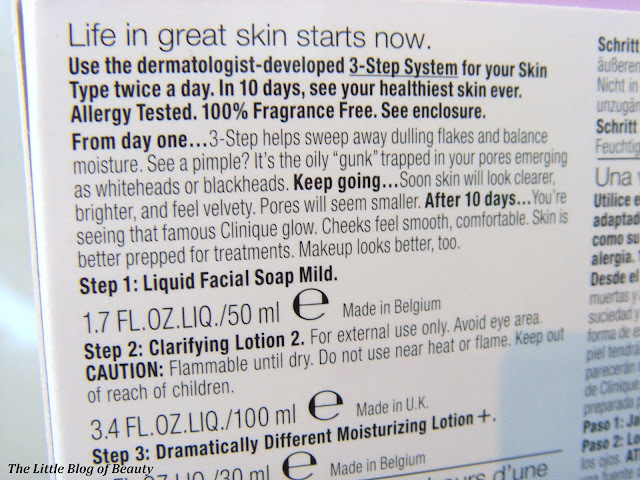 There are four 3-step's available depending on your skin type. 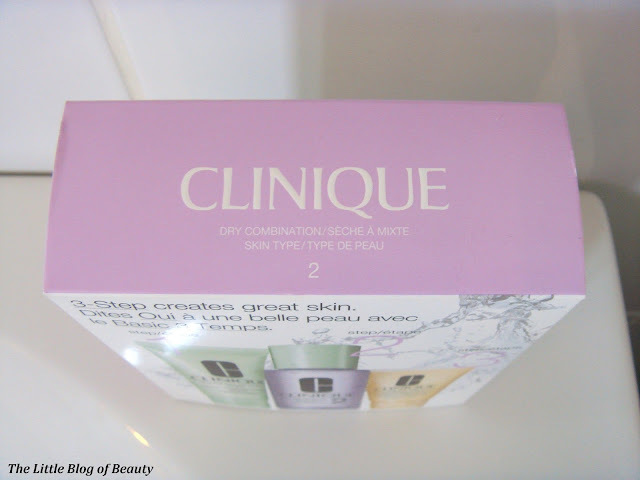 Skin type 1 covers very dry to dry, skin type 2 dry combination, skin type 3 oily and finally skin type 4 very oily. My skin is dry across my forehead and over my nose and cheeks but I have an oily chin so I'm using 3-step for skin type 2. 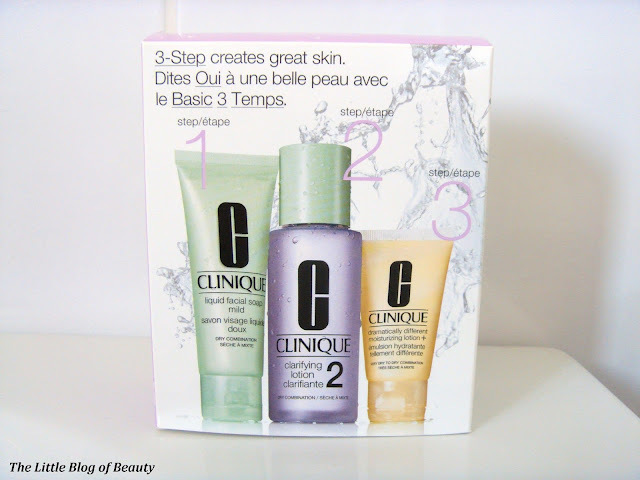 3-step has been designed to make your skin softer, smoother and more radiant with a noticeable difference immediately and continuous improvement over time. I have to admit that seeing the word soap strikes fear in me when it comes to my face after growing up hearing 'never wash your face with soap'. However, this is facial soap, not harsh hand soap, and in the dermatological skin experts of Clinique we trust. This cleanses the skin, removing all traces of makeup and dirt, without striping it and prepares the skin for the next step. The full size version of this comes with a pump that dispenses the correct amount of soap but the mini version in this set doesn't have this so I'm not sure if I'm using the correct amount. I would imagine if anything I'm using a little too much. I started following a routine of cleansing, toning and moisturising a few years ago but I later stopped using toner because my skin is sensitive and dry and I didn't feel that toner was good for my skin. 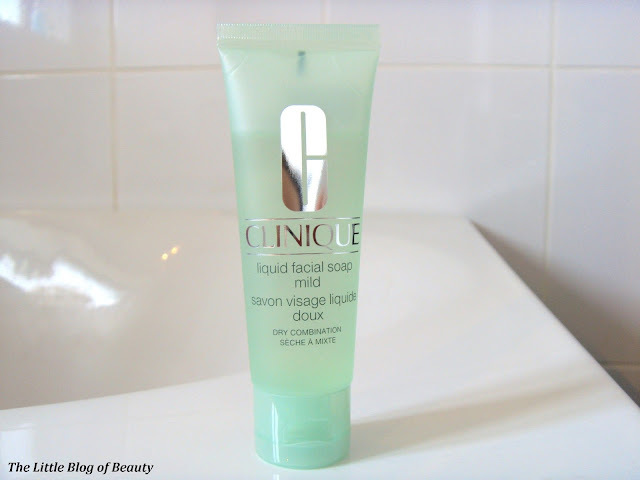 So again I was a little concerned about using a clarifying lotion, but as I've said I trust Clinique. This is a gentle exfoliating lotion which de-flakes the skin and removes dead cells to reveal clearer skin which is then prepared for moisture. I'm no skincare expert but I'm slightly confused how this has an exfoliating action when it doesn't contain any 'bits' to do the exfoliating. The lady on the counter was very excited to tell me that this included the new DD+, which wasn't due to be released for another three days. I have never tried the original DD moisturising lotion so I'm unable to compare the new formula to the old formula but I believe the main difference is that something has been added to help strengthen skin's moisture barrier. I believe I've been using this for around three weeks now although I have only been using this once a day rather than twice. I suffer with redness across my cheeks which can become aggravated when I remove my makeup and by other factors such as the weather and stress. When I use the liquid facial soap this instantly visibly calms my redness and leaves my skin looking squeaky clean. Many facial soaps/washes/scrubs strip my skin of moisture and leave it feeling dry and rough but this didn't strip my skin at all. 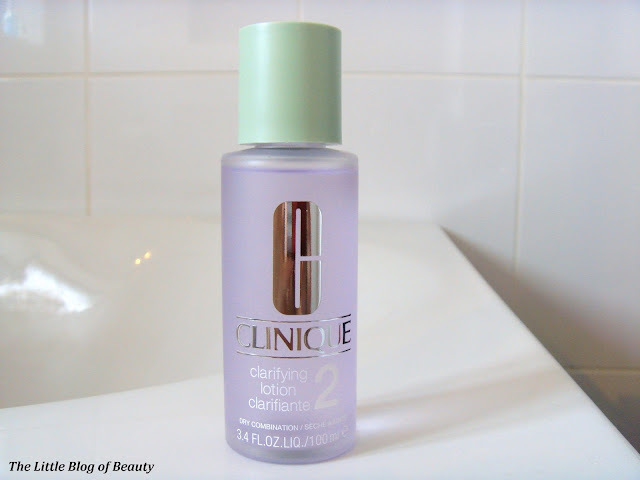 When using the clarifying lotion I'm not sure that I can see any instant visible difference but this does feel slightly refreshing and certainly doesn't upset my sensitive skin in any way. I was a little surprised by how runny the moisturising lotion is but I'm not sure whether it's supposed to be like this or whether it may have actually melted slightly in the current heat and humidity. Despite having dry skin I only need to use a small amount of this as although it's quite a thin lotion it provides a lot of moisturisation. As I mentioned Clinique have added something to the formula to strengthen the skin's moisture barrier and I have found that my skin has held on to moisture much better since I've been using this. Overall I have noticed an improvement in the appearance of my skin since I started using this. Whenever I stay at my boyfriend's house my skin always looks worse than when I'm at home (I don't know why, maybe it's due to different water or something) but my skin has also looked better while staying at my boyfriend's house. I would definitely consider keeping up with 3-step after my introductory kit has finished. Each step of 3-step costs between £11.50 and £29.50 depending on the type of product and the size. 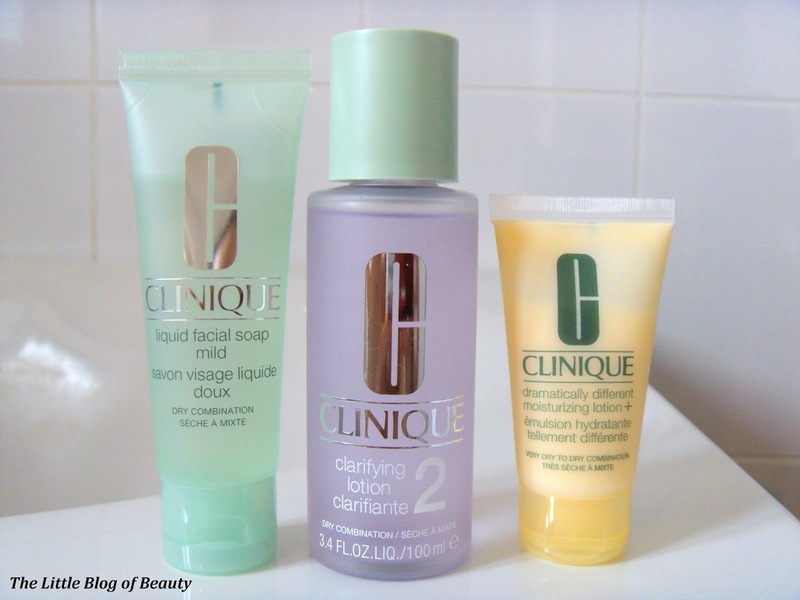 clinique is such a good standard for skin care. 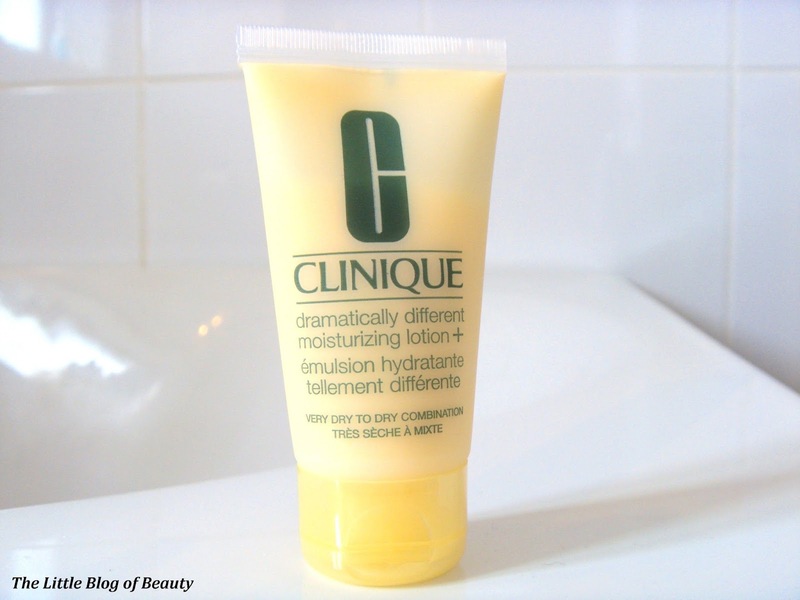 my mom was using their stuff way back when and i used the dramatically different moisturizer. i always forget about this company but they have so many good offerings.